Based on a recommendation from my good friend Joel (his excellent writing can be sampled at his equally excellent project The Ladyist Experiment), today I started playing 11 bit studios’ hyphenate extravaganza This War of Mine. I sunk about two hours into the game, and feel I’ve barely scratched the surface. As such, what follows are my very rudimentary notes on the early experience of the game. 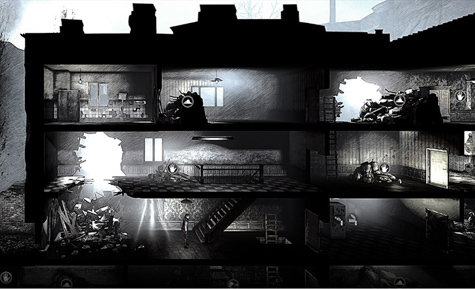 I call This War of Mine a hyphenate extravaganza, because the game posits itself as war-survival. I’d go further, though, suggesting perhaps it’s more of a war-survival-horror-drama. It is certainly no action game, though the distant rumbles of the ongoing conflict can often be heard, and sometimes the booms do get a little close for comfort. The threat, though — and again, at least in the early parts of the game — is less from without than within. Your group of characters — regular everyday folks — must work together to craft various items and make their damaged, multi-storey building into something resembling a home. The visual style, matched with the crafting dynamic, makes this section of the game feel a little The Last of Us — a feeling not dissuaded by the very similar soundtrack and overarching sense of dread. From the little extra reading I’ve done of the game, you are soon visited by other refugees, who request aid, but I didn’t encounter any of these NPC’s in my short run-through. The game markets itself on the tagline “In war, not everyone is a soldier,” and, to its credit, it does indeed paint these three ‘regular’ people as just that. There are tasks in the game that an elite soldier might smash through in a few minutes; these guys have to take their time. They are also affected by illness and fatigue, which further slows their actions. You can craft tools to help them, but the heavier the tool, the more they need to stop and rest. Every action and task in the early part of the game is designed to help these people feel more ‘at home’, to make them more comfortable, and allow them to look after themselves and each other, by cooking food, putting together basic medical supplies and treatments, building a radio so they can monitor what’s going on. These are boring jobs, boring in real life and tedious in the game, but you start to feel an empathy with these ordinary people stuck in extraordinary circumstances. There’s not, as you’d expect, a desperation to these actions. Often the characters will sit around after a task, deep in thought, or simply recovering from fatigue. These tasks are done out of grim necessity, and with an equally resolute attitude, that makes you as a player start to admire these characters. What you are left with, then, is the message the game designers put in the tagline. You are left with an understanding that war affects everyone, including those simply living their lives, trying to stay out of the way. One of the characters was a successful journalist, another a high-profile footballer. The former may have interviewed the latter in the past. None of this matters any more, they just have to work together to stay alive. I’m not sure how the game ends. And while I’m not sure I want to know, I’m compelled by these characters that are as much blank slates as they are fully-formed. I want to know how their stories pan out.